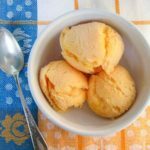 A recipe for homemade peach sorbet using fresh peaches. A delicious frozen treat for summer or any time of the year. In a medium saucepan, heat the sugar and water over medium-high heat until sugar has dissolved and the liquid is clear. Add the chopped peaches and lemon juice and stir to combine. Remove the mixture from the heat and cool to room temperature. Refrigerate mixture for at least 8 hours. Place the mixture in a blender and blend until smooth. Transfer the mixture to an ice cream maker and freeze according to the manufacturer's instructions. Transfer the sorbet to a freezer safe container. Freeze for at least 2 hours. Serve and enjoy!